No more football on the Elephant Park? 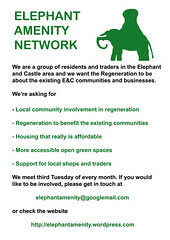 The Elephant Amenity Network turned out in force to try and save Elephant Park last Saturday 26 February. We joined with the football players of the local Latin American football league and met with the ‘Southwark News’ (﻿see here) ﻿﻿﻿﻿﻿﻿in an effort to stop the boarding-up of the park. 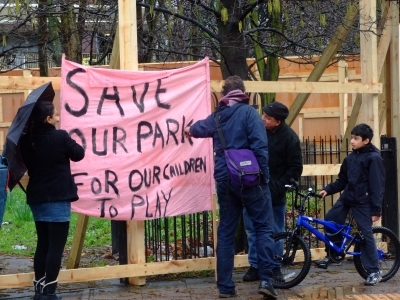 The park is the site of what will eventually be the new market square; in the meantime it is to be let by Southwark Council to the developers of Oakmayne Plaza as a site compound. UPDATE: Read a report of the public meeting on Paul Coleman’s London blog. A public meeting to understand what is happening to the Heygate Estate and to the first phase of the demolition plans. The agenda for the meeting includes information regarding the surveys that the council has carried out on ecology, asbestos and the mature trees on site; the provision of heating to the residents who are still remaining on the estate; planning, building control and environmental health notices setting out how the demolition will take place.